On the Cover: In the 1970s pooling power became commonplace on many railroads, and the N&W was no exception. This train and the surrounding scenery could easily be somewhere in Ohio, but it’s a bit west of there. 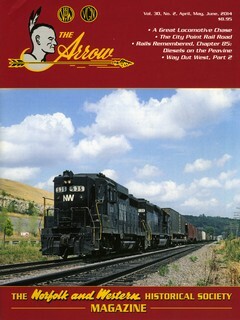 In fact, it’s on the Union Pacific main line west of Kansas City at Bonner Springs, Kansas —even farther “Out West” than the photograph on the rear cover of the last issue. Though Kansas can be characterized as a sheet of plywood with a brick under one end, this location west of Kansas City is in the Kansas River valley with bluffs in the background. On July 26, 1980, this local freight of about 20 cars is powered by N&W GP30 535 and SD40-2 6120, with a Union Pacific caboose trailing. Map Map showing the locational relationship between the Appomattox River and the City Point Rail Road from Petersburg to City Point. Table Train Detours from June 15 to July 13. Timetable As shown here, in 1927 two dailyexcept-Sunday mixed trains served the Hillsboro Branch out of Sardinia. Note that facilities in Hillsboro included a turntable and a water tank, while Sardinia had track scales and a water tank as well as a wye. Passenger service on the branch ended about 1939.